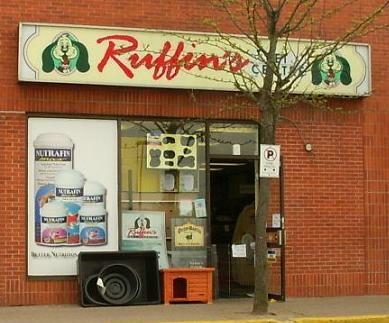 Welcome to Ruffin's Pet Centre in Simcoe! We are located in the Simcoe Mall on the Queensway East (Hwy 3), beside the Canadian Tire! We carry a complete line of pet food, supplies and accessories for dogs, cats, fish, reptiles, birds, small animals and outdoor ponds. We also have a good selection of happy, healthy pets! Our friendly, knowledgeable staff is always happy to help you! Well-behaved, leashed pets are always welcome in our store! Bring your dog in for a free treat sample! Use our links to the left to browse through the site, and if you have any questions, use the contact information at the bottom of every page! Thanks! This many pet lovers have visited this site since March 2007!